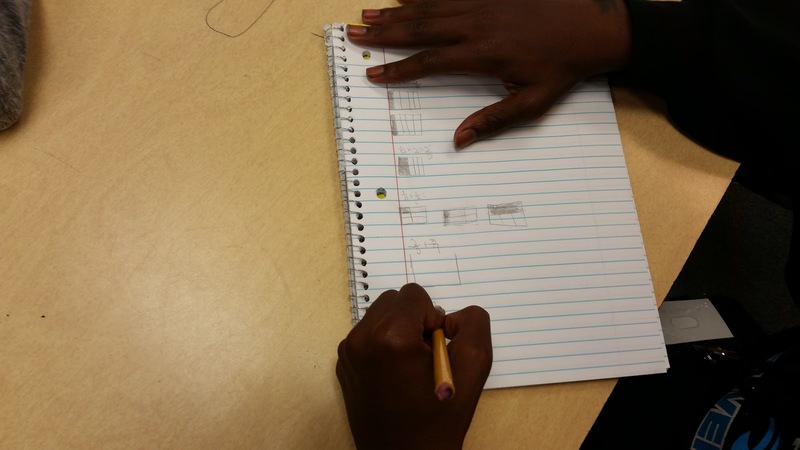 Re-Learning To Teach: Day 23: I Am LOVING These Rectangles! I'm ready for the weekend. Thankfully, we have a clerical day tomorrow, so I have put off all of my grading until then. I've also decided that I can't spend any more time explicitly teaching fraction addition and subtraction. So today, we moved on to multiplication. Of all of the rectangle manipulation of fractions, this was the one that I had the most difficulty figuring out how to communicate. 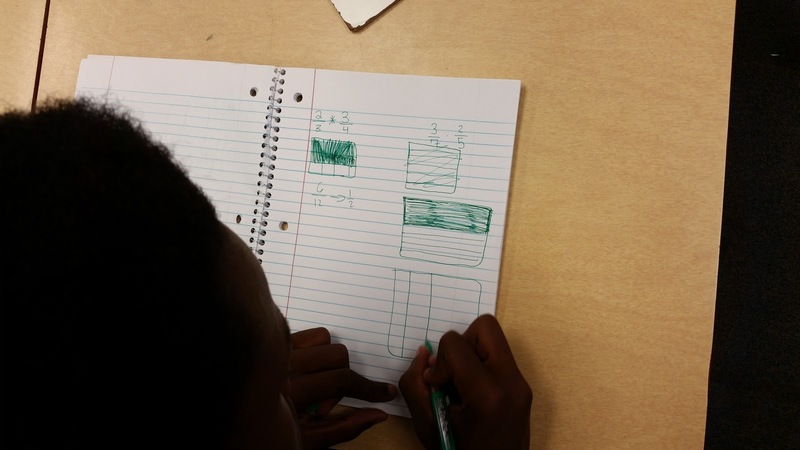 With addition and subtraction, we were taking rectangles with different sized slices, cutting them into equal sized slices and moving them around. 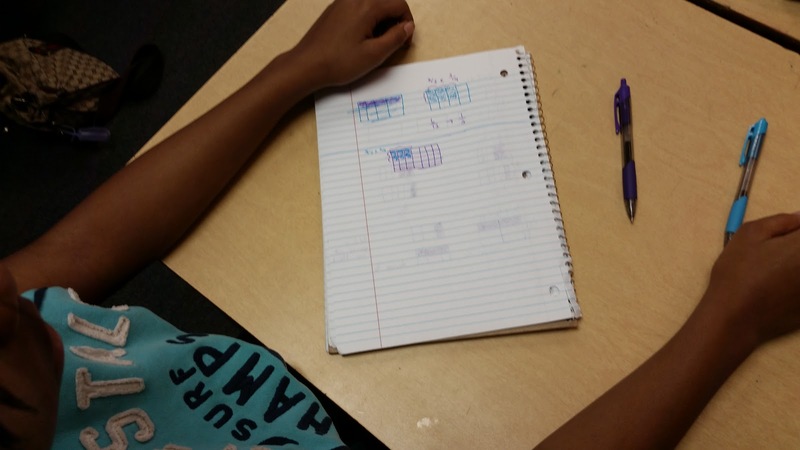 Multiplication was a little more complicated, so I started off simple. Me: "If I have a problem like 2 x 3, what's happening here?" The conversation went well from there. 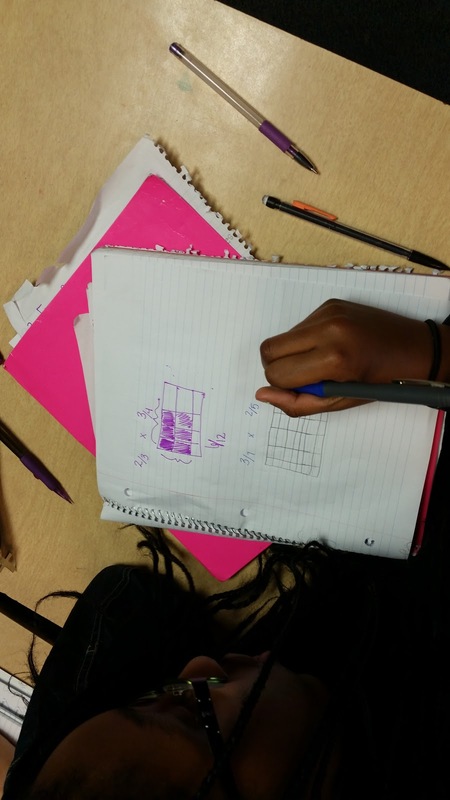 We talked about the difference between whole boxes (integers) and partial boxes (fractions) and how to manipulate them to solve a multiplication problem. After I moved a student from a talkative group, everything else went fairly well. Student participation was up and notes were being taken. They even asked to do more and harder examples! Their willingness to take notes makes me think that they were not doing so before simply because I wasn't explicitly telling them to. Hopefully by the end of the year, I won't have to, but if that's what it takes for now, I'll start the class by telling them to take their notebooks out. I paused it in the middle and asked them what question THEY would ask. They tried every conceivable way to cheat. They wanted to ask two questions, or compound questions, or ask one to each door. When I realized they were having trouble with the concept, I picked two kids. I took four post-it notes and wrote True, Lie, Live, Die on them. I put the first two behind my back, shuffled and had a kid pick one, then did the same with the second pair. Now, only those two knew who told the truth and whose door lead to certain death. Then students were able to ask them questions. After that, I talked about the idea of The Lady and The Tiger. Students were put into groups and asked which door they would pick. Again, they tried getting around the rules, but I refused to ask any questions. We managed to get through 3 trials before the period ended and they were VERY excited to finish the days in the coming week. One student was distraught because her team didn't have as many points as the other teams. She wanted to change teams and was worried that they were going to bring her grade down. We had a chat about how she could be helping them to improve. I ignored her questions about the grade for the exercise. Why can't we just do some things for fun and education? Why does it always have to be for a grade. I think I'm going to stop handing back assignments with grades on them, only giving feedback, and see how long it takes that class to have a breakdown. I started doing this and students seem to get the idea; I think it is working. I got the idea from http://mythagon.wordpress.com/2014/05/02/why-i-stopped-putting-grades-on-papers/. (Then again, I did it at the start of the year.) I only put grades on tests, and projects.